EarthlyTouch is a smooth and calming design, but don’t let its modesty fool you. This is an advanced wordpress theme with great features, including custom thumbnail images and a custom index loop that includes recent comments, featured posts, and random articles. This is a great design for those who want to turn their blog into a professional website. 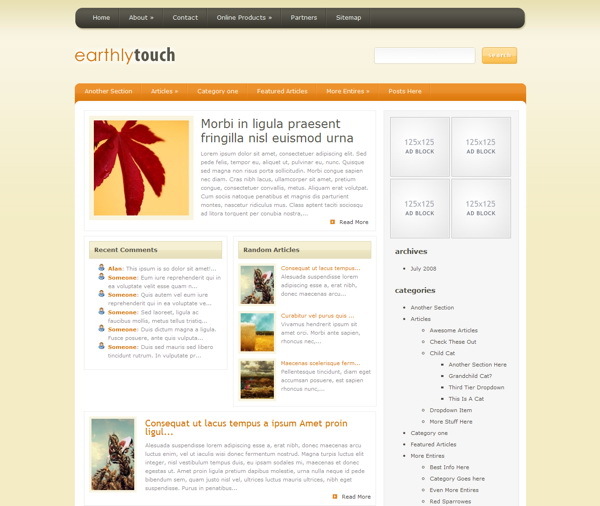 EarthlyTouch comes with five different color schemes. If orange isn’t your style, try out the Blue, Green, Purple, or Red variations. With the featured articles display you can choose to feature your favorite posts on the homepage. You can also choose how many featured articles to display at a time, or remove the featured articles entirely. If you would rather not use the abbreviated post structure you can opt for the optional blog-style layout. When enabled, your posts will be displayed in full like a traditional blog. This theme utilizes timthumb to automatically resize your thumbnail images. Because of this, only one thumbnail images is required per post, despite the various thumbnail sizes used in the theme.